DEAR HOLY MOTHER AND ST BERNADETTE PLEASE PRAY AND INTERCEDE TO OUR HEAVENLY FATHER IN JESUS NAME FOR RS TO GET VERY SUITABLE, GOOD HOUEMATES WHO ARE SANE, PROFESSIONAL, NON SMOKING. NO DRUGS, NO DRAMA CHRISTIAN PEOPLE WHO GET ALONG VERY WELL WITH HER AND ARE FINANCIALLY STABLE AND RARELY HOME. PLEASE HELP US IMMEDIATELY AS WE NEED THE MONEY THIS MONTH TO RENT THE APT. WE LOVE AND TRUST YOU. AMEN! I pray that the contact from chris shadley to me my children three and my family ends from this moment forward and in all our lives after this one too. BY doing so the abuse he bestows upon us will end and end forever. My prayer is one of Thanksgiving for a normal MRI my daughter had and in gratitude to Our Lady’s never ending intercession and all those who prayed for my intentions. I pray for yours. 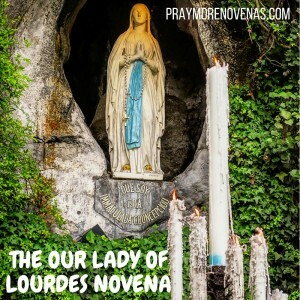 Today is my first day praying Our Lady of Lourdes Novena. A bit late but I will continue. Today I pray for our prayer community and their intentions. I pray that John and Katie seek the knowledge of God’s will for them and He gives them the power to carry it out. I pray for all those who have lost their faith and hope they receive the amazing gift God blesses us with when he restores our faith. Dear Jesus and Mary, thank you for keeping our son safe last night, while driving home in icy rain. Please continue to keep my family and I safe and healthy. Please heal us of depression, anxiety, asthma, allergies, TMJ, sciatica, heart disease, diabetes, fibromyalgia and colon problems. Our dearest Mother, I am praying for my family, especially for MB. Blessed mother on this 5th day of this novena I am praying for a miracle. I am praying for the revamping of my finances. I am pray. For money to finance my son’s wedding ceremony. I pray for a miracle today. Jesus I put my trust in you.